Gods Will Be Watching is a very unique game. I've spent over five hours playing that game and at least as much time trying to understand how I feel about it. This, along with games like Papers, Please is exploring what games can be. This article is going to go over what Gods Will Be Watching really is and is benefited by having played the game. Also, spoilers are somewhat of a necessity. 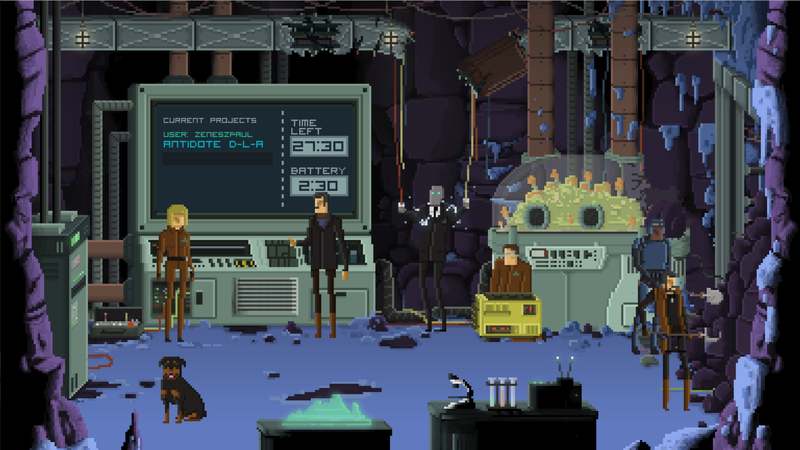 A large part of what makes Gods Will Be Watching so compelling is how excellent the story and art are. This game runs with beautiful art reminiscent of Superbrothers: Sword & Sworcery EP and a highly compelling story of far-future terrorism. There are a number of nice small touches that speak of their dedication to the story. You see small things like a full animation for Liam tearing off his jacket before starting to hack, which do an amazing job of selling the high-stakes, high-action feeling of the game. The game itself is intensely hard and proud of it. In itself, this is nothing new. Indie games have quite the history of difficulty. What makes this game so different is the method in which it is attained. Despite the appearance and marketing of a point-and-click adventure, this is really a game about manipulating a spreadsheet. That is not a negative point, many games, especially turn-based ones, are just spreadsheets in a very good disguise. What really distinguishes this game is how little it cares about the player having fun. This is what makes this game so hard for me to understand. This game makes many decisions that normally would be cardinal sins, but the fact that this game is not intended to be fun makes it much more complicated to figure out if they should be condemned. First, I'm going to go over the decisions that the game made that I find strange. Actions with unclear effects are normally something I try to avoid. Having the player fail due to something that she doesn't understand is frustrating and the fault of the game, while failing due to a predictable game interaction is the fault of the player and avoidable by the player. This makes for a less frustrating experience and the player learns something as a result, the fun of which can help offset the pain of failure. Gods Will Be Watching is built on the assumption that you will fail multiple times because you don't understand the effects of the actions. Additionally, in a number of cases where the numbers are actually exposed to you, they are hidden multiple clicks away from the player. To take the first level for example, shooting a hostage stops you from negotiating with the rescuers. Nothing in the game tells you this and it took watching a playthrough for me to figure this out. The cause and effect here are completely removed and thus difficult to puzzle out. While this case makes sense, the fact that the game doesn't tell me before or after the fact makes it inscrutable even after multiple playthroughs. The game has points where you do not know what is going to happen, which can add tension and exploration. This can aid in role-playing. This forces a trial and error approach to learn the systems. This forces the player to repeat the game many times. This is a way to add difficulty. Success is based largely upon pure RNG. In the torture scene for instance, I failed one of my tries simply because I was unlucky when the man pointed a revolver with a single bullet in my face. Soon after that, I succeeded with exactly the same strategy and a lot more luck in that specific scene. This adds difficulty to the game and in many spots adds tension as well. The act of putting your life in the hands of the RNG can be intense and having a hunting expedition do poorly forces difficult choices on the player, both of which are where the fun of the game can lie. However, the punishment for a bad roll of the die is often a full restart of a level, even if the process then used is exactly the same. This forces the player to repeat the game many times, often through no fault of her own. This does often create tension and forces the player into uncomfortable situations. 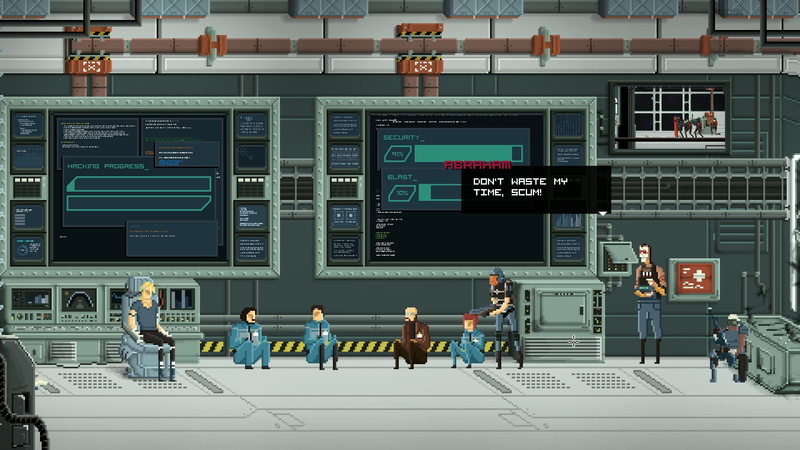 Gods Will Be Watching is clearly designed to be difficult. The difficulty helps create a setting and communicate story, both of which are the core of this game. However, it is worth examining what exactly it does for those. Abraham is clearly a far more than ordinary man. He finds ways out of situations where most people would fail. I know this because I failed at them many times but, by the story, Abraham succeeded. This is all well and good, but it does not hold up well to deeper examination. When I beat a level, part of it is because I now understand the systems, which implies that Abraham does as well. Fictionally, this makes no sense, at least up to the point where I played. If Abraham is supposed to be so good that he can figure out the spreadsheet behind the social situation, then I should be able to see it as well. One very strong moment from the game is when you have to divide up food and Abraham doesn't need to eat. This works perfectly as I am him and we are superhuman. This is where you truly feel like you are playing the supersoldier that Abraham is supposed to be. Knowing things that he didn't before just makes no sense. Similarly, his story as someone special falls apart when you fail the first time because of luck and succeed the second time for the same reason. As a side note, many games use difficulty to add to the fun when a player wins. Victory feels much better when it is earned. However, as so much of the difficulty of this game comes from grinding the game until the systems make sense and hoping that luck is on your side, the victory here does not feel like the result of skill and so is not very satisfying. 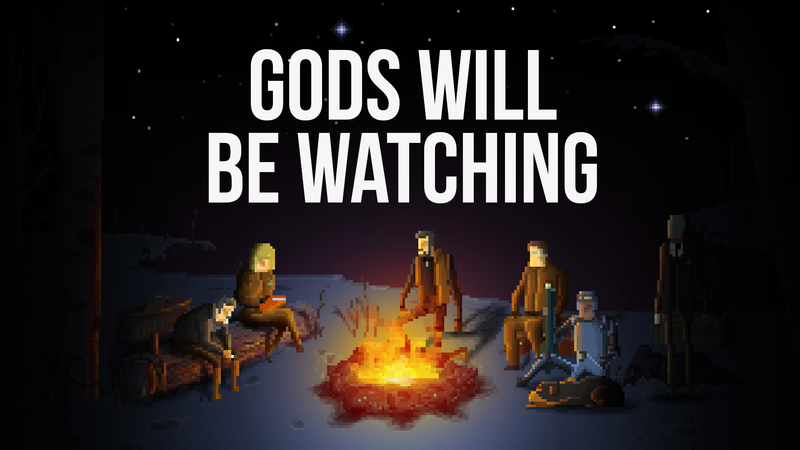 As stated before, Gods Will Be Watching does not seem to be designed with player fun in mind, so this is not really relevant, just interesting. The positive result of this repetition is that the player is forced to value every playthrough. The cost of failure is spending a lot of time not having fun and so I can't essentially save scum my way through the game. It definitely adds to the tension of the randomness. It could have also led to a lot more experimentation in each attempt, but that is a sub-optimal strategy and the brutal difficulty of the game makes playing sub-optimally very expensive for the player. Understanding the spreadsheet is critical to beating a level, and so the player must take actions that help him with that as a first step. On the other side, making a player mechanically perform actions that do not challenge him over and over again removes a lot of fun from the game. This game may not care about that cost, but the cost still exists. Not only does remove fun, but it does so by becoming uninteresting for periods of time, which is a cost that this game should have been much more wary of. Plenty of moments in the game are strong when you first experience them, but lose all impact by the fourth one. Gods Will Be Watching makes a lot of experiments with the form and I am very happy that they did so. Sadly, not all of them paid off, but as their game shows, that would be a lot to ask for from a first attempt. It may not be the path that I would hope for future games to follow, but it does help define the map. It's definitely not a fun game, but it is just as assuredly an important one.